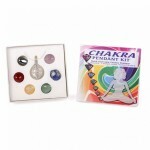 Chakras are said to be force centres or whorls of energy permeating from a point on the physical bod.. 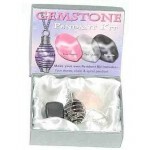 Box of 25 Gem Stones in beautifully design see through box..
Make your own Pendant Kit.Includes four Stones, Chain & Spiral PendantStones:Amethyst, Rose Quar.. 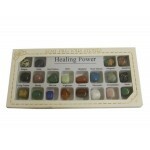 Box containing selection of 20 Semi Precious stones, each with primary function of stone's healing p..
Dalmatian Jasper is also known as Dalmatian Stone. Its helps the over-analyzer to ground and center ..
Rose Quartz is a beautiful pink variety of the mineral Quartz. The colour is thought to be due to tr..
Agate is a very fine grained form of Quartz.It grows within volcanic lava bubbles known as geodes.Di.. This box contains 9 bottles each containing a different type of chipped semi-precious ..